In one of the SEO summits, the Chairman of Google Eric Schmidt said, “Mobile has won”. Nowadays, many consumers make purchases using the mobile phones. However, those companies succeed in satisfying customers, which provide the best user experience. So, as a marketer, it becomes important for you to know how consumers spend time on your website and how they make their buying decisions satisfying their wants. Accordingly, you have to resume complete mobile application development to get the best business returns. Google has identified a few touch points of consumers that need to be addressed clearly, while you want to develop mobile apps. Remove All Obstacles – The key to offer an interactive user experience to consumers is by ensuring that they can easily access the information, which they want to satisfy their personal needs. Splash Screens – Consider using splash screens while you are developing a mobile application. These screens provide short, but vital window for user’s engagement. You need to be cautious while providing tips because they may interrupt customers through the decision making journey. If applied in right form, these screens can guide users through the initial experience. Non-signed in Journey – While designing mobile app, make provisions for non-signed in journey for preventing barriers to conversion and request customers for signing up at that time, when your application is dependent on user’s data for providing value. In addition, clearly mention the benefits of signing up to the users. Help Users for Making Decisions in Simple Way – Your mobile app should allow consumers to find information with ease, offer suitable environment for conducting research on services and products and facilitate the purchase-decision process. Keyword Driven Search – While putting contents on application, ensure that the search operation should be keyword driven, so that the information becomes visible in right time and lead to conversion. Offer Product Screens – Product screens help users in performing key actions like booking an appointment, adding items to wish lists, baskets, etc. Keep provisions for saving data, so that consumers can refer to it while making the final decisions. Ensure the Compatibility of the App – Ensuring compatibility is important for capturing offline and cross device conversions. Users often conduct research on services and products across multiple devices in retail stores for making purchase decisions. Therefore, allowing the consumers to make transitions from one touchpoint to other is the secret for raising conversion rates. Provide Convenience to Users – Ensure that first time users can easily pass through every check out stage by spending less effort and do not face distractions and draw user’s benefit from single screen checkout or pre-populated data. Encourage Users to Checkout – Provide more product choices to the users and provide clear confirmation of every added item including complete pricing details. The users should also know what other users are recommending and should be able to edit selected items. Convenient Payment Methods – Make the payment procedure convenient for new and returning customers by adding suitable inputs like payment options, express payment and scanning cards. The returning users should get pre-populated data to save time during checkout. Remove Distractions – Make sure there is no distraction at the checkout. This will encourage more conversions and retention. While developing mobile application, you have to see that users can serve themselves and manage transactions with you anywhere and anytime. This will also help you build loyalty among users. In addition, passes and vouchers should be readily received and redeemable through the mobile app. Allowing consumers to view loyalty status and receive updates on changes can improve user experience. Keep the above tips in mind for your next mobile apps development projects. Remember, providing the best user experience can lead to fruitful conversions. Nice blog, worth reading! I would recommend all to read it to learn Google has pointed out a few factors related to mobile app development. 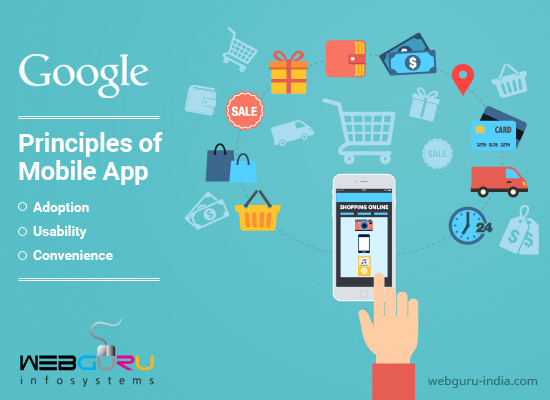 Get some quality app development tips along with secrets to mobile success revealed by Google. Thanks for the useful blog! Amazing app development tips on the new App UX report published by Google! Thanks guys!